For our first major concert, we couldn’t have asked for a better artist. Imagine Dragons blew us away, leaving Perth Arena in absolute awe of what we had just witnessed. The night opened with The Temper Trap’s 'Thick as Thieves'. They played through 'Fall Together', too, as well as treating us to an instrumental titled 'Drum Song'. They finished off their set with 'Sweet Disposition', delivered to a stadium of glowing torchlights singing along. Lead vocalist Dougy Mandagi never failed to impress us with his falsetto voice, ability to play the piano, maracas, guitar, tambourine and drum (seemingly all at one), and of course, his luscious flowing hair. With the stage fading to black, the headliners stole the show. Images of documentaries and nature recounting the existence and evolution of man flashed across the screen to kickstart the Oceanic leg of their Evolve World Tour. 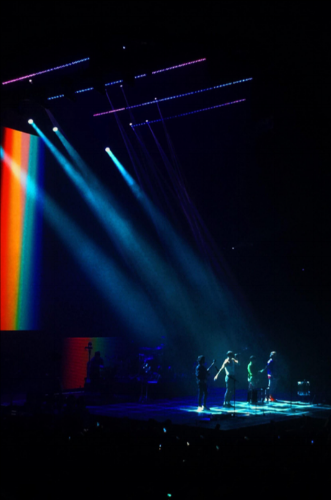 Imagine Dragons opened with 'I Don’t Know Why', basked in prismatic rainbow light, and it was surreal. All four of them had explosive energy that they managed to sustain throughout the night. Every single second of the show held the audiences captive (it helped when the lead singer Dan Reynolds took off his shirt #hearteyeemoji), and not for a second did we feel the need to do anything else but revel in the splendour unfolding before us. Although filled with action, Dan took opportunities to take a break and have heartfelt conversations with us regarding gun violence (extremely pertinent with the heart wrenching events in Margaret River this week), opening up about his depression and anxiety, and to thank everyone endlessly for giving him the opportunity to lose himself in the wonder of performing. They played through a majority of their new album, but didn’t forget to include audience favourites like 'It’s Time', 'Demons', On 'Top of the World' and 'Radioactive', as well as including their own renditions of 'Forever Young' and 'Three Little Birds'. Throughout the entire performance you could just tell the entire band were just enjoying themselves. Dan fluttered around the stage, laughing, dancing, joking around and even took a moment to have a power nap during Wayne Sermon’s guitar solo (seeing Dan jump around stage was a bit scary, though--there were a couple of times where we fully expected him to fall off stage or throw a mic at someone in the audience). Watching how much synergy the band had was astounding, too. There was a point in the song 'On Top of the World' where Dan couldn’t stop laughing, but the band kept up with him to let him have another go at singing the chorus. It’s one thing to see a solo artist perform, but watching a band have fun together and work together and keep up with each other when something doesn’t go the way it’s meant to--it makes you feel like you’re part of their little family too. The raw authenticity they imparted in their music, not just replicating their studio tracks but reworking them to be different, yet just as meaningful. They mixed it up by showcasing everyone’s talents, from the drum solos to guitar solos to bass solo. About two-thirds through the show the band migrated to the opposite side of the arena to perform an acoustic set with a cello, double bass and violin, performing acoustic covers of 'Next to Me' and 'Bleeding Out'. There was something really beautiful about a grown man with a full beard and clout goggles masterfully playing the violin. To be honest, I have never been a really big fan of any artist. I like what I like, but seeing these four live, on stage was a completely new experience that immediately made me fall in love with them. To be able to see an artist that has always seemed to be a voice on a recording was mind-blowing. On this night, I think Imagine Dragons became something more than just a band to some of us--they became role models who love what they do and the people who support them, but more than that they became real. I don’t think we’ve ever seen a demographic so varied in one place before (Reuben spotted a granny in the mosh pit, we were sitting next to an elderly couple, and we saw an entire family of 7 in that arena) and I honestly think that that is the kind of unity we need in the world we live in. May 15 Podcast: Dissecting "Avengers: Infinity War"